As the tree service Tampa depends on, we take tree removal seriously. It’s a complex and dangerous job and one that should only be done by a highly skilled and experienced professional. It’s also something that cannot be undone, if a mistake is made, which is why it is essential to choose the most qualified team to care for your trees. Whether your tree is damaged from a storm, rotting from the inside out, or leaning on your home, we can remove it for you. Our team of professionals has safely and successfully performed tree removals of every size, from small palms to gigantic southern magnolias. Even if you aren’t sure whether or not your tree should be removed, give us a call today and we will come out for a free assessment. ​Once you contact us, we will send one of our tree experts to your home or business to asses the tree or trees of concern. He or she will give you their professional recommendation and a price estimate for the job, before working with you to schedule a day and time for service. 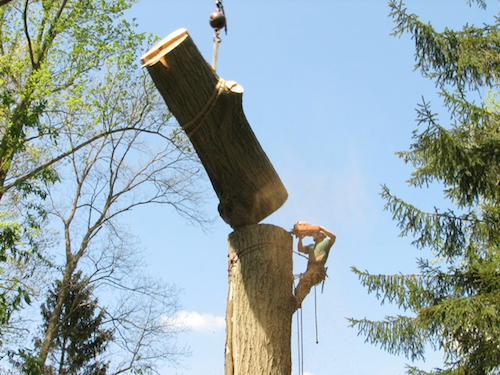 ​Your tree will be cut into pieces, limb by limb, following a plan formulated specifically for your tree. The heaviest branches will be lowered to the ground first, using a system of ropes and pulleys, followed by the lighter limbs. On the ground, the largest branches will be cut into smaller portions and the smallest will be put into the chipper. When only the trunk of the tree remains, it will then be cut into small sections and removed until all that is left is a short stump. For the duration of the removal process, the ground crew will continuously clear the area of debris, in order to avoid potential hazards and maintain a safe work space for the team. When the tree is down and only a small stump remains, you can choose to leave the stump or have us grind it for you. Then, all wood from the tree will either be stacked on your property or transferred to a nearby truck to be hauled off. Our team will clean the area thoroughly, leaving no trace. It is our promise to you to always leave your property looking more beautiful than before. 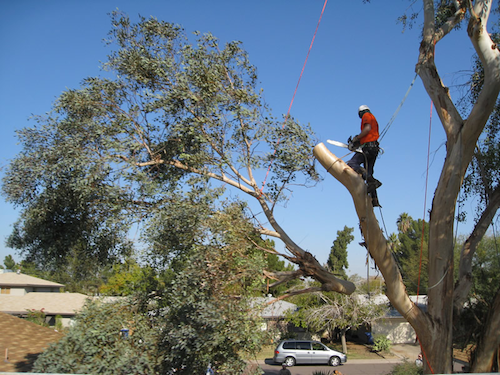 Part of providing the tree removal Tampa depends on, is putting our customers first, especially when it comes to safety. We never recommend attempting to remove a tree on your own, without the expertise of a certified tree professional. It is simply not a risk that we would advise any home or business owner to take, as there are too many ways in which things can, and likely will, go wrong. 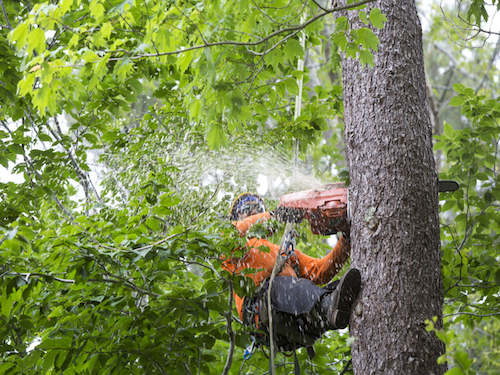 All of our tree care experts are trained and experienced in safely removing trees - allow us to do the work for you and avoid a messy situation. Call the team for tree removal Tampa trusts!